How many participants / attendees are expected? Is there an honorarium budgeted? Areas of Expertise: American evangelicalism, church and state, politicized religion, how right-wing Christians think and see the world, evangelicals and Trump, the future of American evangelicalism, evangelical embrace of gun culture. Regarding Spiritual Truths in the Midst of Life’s Difficulties. . . Sharing his personal experience of visiting with the families of both the shooter and victims involved in the 2006 Nickel Mines, Pennsylvania murder of five Amish girls in a rural school house, Rob explains what it was like to watch church elders forgive the perpetrator’s family in the immediate aftermath of this unspeakable crime. Rob was called to the scene by long-time supporters of his ministry organization who employed the shooter’s mother. When he arrived just hours after the tragedy, Rob led a community prayer service and was taken to the home of the parents of shooter, Charles Carl Roberts IV, who had taken his own life after killing and wounding the school children. Roberts’ widow, Marie, was at the Roberts house along with their three young children. While Rob was present, Amish elders arrived at the home and offered the family forgiveness so they could sleep peacefully. The next day, Rob was taken to the Fisher family farm where 13-year old Marian Fisher was being prepared for burial. He was invited to stand with Marian’s grandfather, a bishop, who delivered a sermon on forgiveness as standing over his granddaughter’s open coffin. Rob was asked by Amish community leaders to speak to the media on their behalf, which he did in interviews with CNN’s Larry King, Fox’s Greta Van Susteren, and NBC’s Ann Curry. A week after the tragedy, Rob returned to visit the families who lost their children and some whose children survived with serious injuries. What he heard from the families becomes the central part of this moving, sometimes disturbing, but in the end, uplifting talk. Regarding Bonhoeffer and the Church . . .
Dietrich Bonhoeffer stressed the importance of dealing with real-life situations. He warned it’s too easy for the Christian to fly into fantasy, wishing things were different, or that everything—including our personal interpretation of the gospel—would always work perfectly. Of course, nothing is perfect in this fallen world and Christians must be ready to deal with that reality. If the gospel cannot work within the framework of what is real, then it is not the gospel! In this talk, we’ll explore what it means for the Christian to encounter reality, how it affects our witness for Christ, and the surprising things reality may call on us to do. Bonhoeffer’s first doctoral dissertation, Sanctorum Communio, dealt with his theme of Christ existing as community. This theoretical construct would be expressed concretely in the “Brothers’ House,” which was the inspiration for his books, The Cost of Discipleship and Life Together. Bonhoeffer didn’t just believe in the importance of relationships, he lived that principle. In this talk, we’ll explore why Bonhoeffer preached and practiced the need we have for one another and what is implicated in realizing true community. Contemporary celebrity culture leads most of us to conclude that anyone as smart, as brave, and as spiritual as Dietrich Bonhoeffer would be very popular and command a big following. That was not true for the young, bold pastor from Berlin. Like the Lord he served, Bonhoeffer was largely rejected by his own, his fellow clergy and the leaders of the Evangelical Church in Germany. More than once, people walked out of the small crowds that attended his sessions at conferences and conventions where he issued his blistering critiques of religious institutions and political movements. By the time he was martyred in a concentration camp, Bonhoeffer was so alone it took months to find out what even happened to him. Jesus told His disciples that his way would be traveled by only a few. What does this lonely path suggest to us about the cost of discipleship? Regarding Guns and the Church . . .
What’s with the Gun Bibles? Rob calls himself a “loving critic” of his own evangelical community. In this talk, he takes on evangelical enthusiasm for unfettered gun rights and, what he sees, as an inordinate bolstering of the Second Amendment by many pastors, some of whom carry handguns into the pulpit on Sundays. As the subject of the Emmy Award-winning feature length documentary, The Armor of Light, directed by Abigail Disney, Rob has become known as an expert on this subject. He has published extensively on the conflict he sees between the message of Christianity and the embrace of popular gun culture by those who call themselves Christians. In books, magazines, and OpEds, he has called for a serious examination of the moral, ethical, and even spiritual and doctrinal questions surrounding this phenomenon. During his presentation, Rob will display an item that provides shocking evidence of how serious this problem of infatuation with firearms has become in his evangelical world. In the end, Rob calls for a new reformation in his religious world and suggests the path toward realizing it. Christians and Guns: Second Amendment or Second Commandment? What is it about born again Christians and our guns? Why would people who put faith above fear reach so quickly for a literal sword over the Sword of the Spirit, which is the Word of God? The Bible says, “Some trust in chariots and some in horses, but we will remember the name of the Lord our God.” Does the reliance of church folk indicate a failure in faith? If so, how do we return to confidence in God over a Glock? Does a pro-life worldview complement or contradict a pro-gun position? Does armed self-defense advance respect for the sanctity of human life or does it work against it? Deciding whether to arm oneself involves many more questions than what kind of gun and ammo we need. In this presentation, we will explore and ask the bigger questions about life and death, good and evil, and faith and fear. Respect for God-given human life involves all these questions and more. We often think of conversion as a once-in-a-lifetime experience, but that isn’t always true. A conversion is a turning point, and I can identify three major turning points in my life and Christian experience. The first and last were for the better, but the one in between was a mix of good and very bad. Not all conversions are good ones. In this talk, I share the surprising highs and lows of religious crises, the lessons learned from three major inflection points in my life, and what I learned from these experiences about faith, spirituality, religion, God, myself and others. In this talk, Rob tells the dramatic story of his life, based around three conversions: From the nominal Judaism of his youth to born-again Christianity; from a simple, straightforward gospel centered on Jesus as peacemaker between God and humankind to the aggressive politicized religion of Ronald Reagan; back from rightwing politics to the Sermon on the Mount. 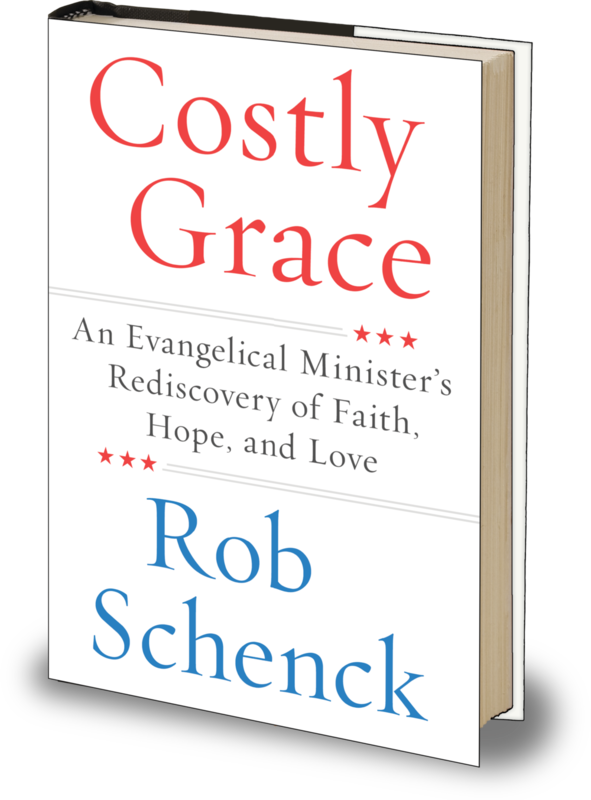 Tracing his gradual embrace of money, influence and prestige, Rob explores how he went from ministering to some of the poorest people in the world, living in literal garbage dumps, to being at the beck and call of those at the highest levels of power in the U.S. government, including presidents, leaders of Congress, and Supreme Court justices. As he now sees it, this trajectory took Rob away from the simple calling to serve those in need and thrust him deep into a spiritual dark wood where he lost his ethical compass. It would take a series of crises, some of them disturbing and others humorous, to set him back on a proper and humble course. Along Rob’s remarkable journey you’ll meet many outsized personalities he kept close company with like Christian TV personality Pat Robertson, moral majority founder Jerry Falwell, former Alabama chief justice Roy Moore, and US Senator Ted Cruz. The story of Christianity contains an endless string of attempts by earthly powers to coopt the church and use it to achieve political ends. Church history is equally marked by the church’s willing subservience to the state. The Bible itself is replete with accounts of national idolatry, spiritual infidelity, and fickle devotion—or lack of it. Jesus also spoke directly to questions of power, politics, and faith, giving warnings and commands about remaining faithful to one Lord. In this talk, I explore the danger of linking these three elements of human life and experience and what we can do to avoid such a trap. As long as the church is made of human beings, it will be imperfect. Still, this reality doesn’t excuse immoral beliefs and harmful behaviors. The people of God are held accountable to a higher moral authority than themselves and must strive to think and do better. Evangelicals, being Jesus-centered, have the greatest exemplar. Today’s evangelicals are struggling with who or what to follow: Christ, the latest celebrity, a politician or political party, or a combination of any of these. In this talk, I point out the spiritual, moral, and ethical failures in evangelicalism, particularly in the American brand. It’s a loving and constructive critique of the family I will never leave and that I always love. This is my personal story of setting out to follow Christ as I saw him in his Sermon on the Mount, how I lost my way and became mired in an earthbound, light-on-love politicized Christian activism, and eventually found my way back to simple faith and obedience to Jesus’ two Great Commandments, to love God and love people. In this talk, I spend a good deal of time on my posthumous mentor, the brilliant, insightful, and deeply spiritual German pastor, theologian, and ethicist Dietrich Bonhoeffer, whose steps I followed in a pilgrimage through Europe in 2010, leading to a dramatic third conversion. This talk presents the work of the newly established Dietrich Bonhoeffer Institute in Washington, DC. This thought and action tank is dedicated to applying the theological and ethical insights of this brilliant World War II-era Protestant church leader, Nazi resister, and moral philosopher to the social crises of our time. TDBI sponsors lectures, symposia, and discussion forums and publishes relevant material online and in books, opinion papers, and pamphlets. I explain how our challenge as an institution and community is to continue the work Bonhoeffer started but was interrupted in finishing by his untimely execution in a Nazi concentration camp and I invite all who want to join us to do so with the same optimism Bonhoeffer exhibited up to the moment of his death. Published in Huffington Post, Patheos, Vice, Christianity Today, The Christian Post, New York Times, TIME, Washington Post, Sojourners, The Christian Century, among many others. For more information or to arrange a speaking appearance by Rob, contact Melinda Ronn.